For the American football team, see Chicago Black Hawks (American football). "Blackhawks" redirects here. For other uses, see Black Hawk (disambiguation). 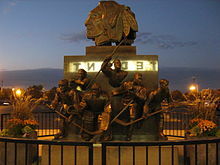 In 1938, the Black Hawks had a record of 14–25–9, almost missing the playoffs. They stunned the Canadiens and New York Americans on overtime goals in the deciding games of both semi-final series, advancing to the 1938 Stanley Cup Finals against the Toronto Maple Leafs. Black Hawks goaltender Mike Karakas was injured and could not play, forcing a desperate Chicago team to pull minor-leaguer Alfie Moore out of a Toronto bar and onto the ice. Moore played one game and won it. Toronto refused to let Moore play the next, so Chicago used Paul Goodman in Game 2 and lost. However, for the third and fourth games, Karakas was fitted with a special skate to protect his injured toe, and the team won both games. It was too late for Toronto, as the Hawks won their second championship. 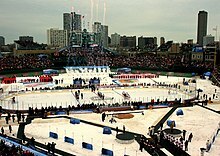 As of 2014[update], the 1938 Black Hawks possess the poorest regular-season record of any Stanley Cup champion. The Blackhawks offense was led by Patrick Kane, who scored an NHL-best 106 points in 2015–16 and also won the season's Hart Memorial Trophy's as league MVP. Panarin, who skated on Kane's line, won the Calder Memorial Trophy, awarded to the NHL's best first year player. Midway through the season, the Blackhawks attempted to supplement their roster by making several trades. The Blackhawks dealt Jeremy Morin to the Toronto Maple Leafs in exchange for Richard Panik. The team then reacquired Andrew Ladd from the Winnipeg Jets in exchange for their first round selection in the 2016 NHL Entry Draft and Marko Dano. The team then traded Phillip Danault and their 2018 second round pick to the Montreal Canadiens in exchange for forwards Dale Weise and Tomas Fleischmann. The team finished with a 46-26-9 record, good for 103 points and third place in their division. The Blackhawks were defeated by the St. Louis Blues in a seven-game series in the first round of the 2016 playoffs. The loss marked the Blackhawks earliest playoff exit since 2012.